Just as we were getting ready to get it on March 15, we got even better news. 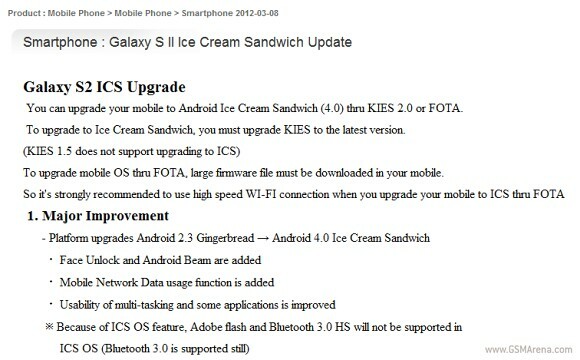 Samsung I9100 Galaxy S II will be receiving an update to Android 4.0 Ice Cream Sandwich on March 10 - less than 48 hours from now. Update: Samsung used its Twitter account to deny the statement of its website. It turns out the ICS update release date is still not settled and it will be announced at a later point in time. As you can see in the screenshot above, Face Unlock, Android Beam, and mobile data usage are among the major improvements which will come with the update. In a rather interesting fashion, flash support and Bluetooth 3.0 HS will not be supported due to an "ICS OS feature." It is needless to tell you that we will be checking regularly our office I9100 for the update. In case you upgrade your own handset, feel free to drop us a line with your impressions in the comments section. In the meantime, check out our video preview of an unofficial ICS ROM for the I9100 here. Its already been 3 days but we havent got the Update of ICS on S2...!Literally waiting for the change of OS as it is going to be a massive change...! Just give us the xact date so that we can try ittt...!